Welcome back to Toy Aisle, io9's round up of the best toys we’ve seen all week. 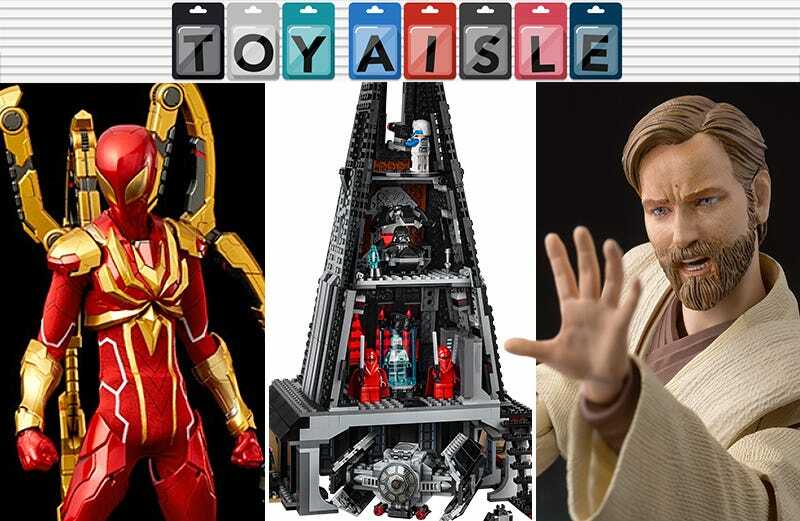 This time round, a very cool take on the comic book Iron Spider suit, Obi-Wan Kenobi reaches out into the Star Wars figuarts line, Darth Vader’s sinister castle gets a slightly less sinister Lego set, and more. Check it out! With a fantastic new game on the PlayStation, a new animated movie en route, and another Avengers sequel around the corner, everything’s coming up Spider-Man these days. Even Spidey action figures are at peak amazing, as Sentinel’s RE:Edit Series sixth-scale Iron Spider demonstrates. Based on one of the Stark-designed Spider-Man suits from the comics, this 11-inch figure boasts a staggering number of articulated joints thanks to the three additional robotic spider legs coming out of Spider-Man’s back. The posing potential is limitless, which helps explain why you’ll need to cough up $285 for this collectible. A new Star Wars TV show means new Star Wars action figures, and the cartoony world of Resistance is no exception. Sadly, if you end up enjoying the show when it launches this weekend you won’t be able to race out to stores like an ace pilot yourself and bag Hasbro’s new range of 3.75-inch, five-points-of-articulation figures based on the heroes and villains of the series—they’re not due out until spring 2019, which means even Christmas is out of the question. When they do arrive though, the figures, loosely approximating the stylization of the show, will include their own accessories, mostly in the form of removeable pilot helmets (because our heroes are pretty much all ace fighter pilots) and blasters (because duh, Star Wars). Just look at that chunky lil’ BB-8 though! Adorable. Everybody needs a place to get away from it all. Batman’s got his Batcave, Superman’s got his Fortress of Solitude, and Darth Vader’s got his towering obsidian castle on Mustafar. Only recently appearing in the Star Wars movies (but with a history stretching back all the way into early Empire Strikes Back concept art), Vader’s Castle is finally ready for the Lego treatment with a new 1,060-piece, $130 set that will be an Amazon-exclusive for the holidays. It includes an underground hangar housing Vader’s TIE Advanced Fighter, a bacta tank where Vader can unwind, and a meditation chamber where he can ponder his plans for defeating the Rebels. The set also comes with five minifigures, but that includes two versions of Vader, and two matching Royal Guards. You might know Mondo more for its posters than anything else, but its occasional figure releases have so far produced some very fancy-looking, stylized takes on pop culture icons. Their latest heads to Castle Grayskull with a suitably beefy He-Man, marrying the classic look of the animated show with a more realistic style. At around 12 inches in height, Prince Adam comes with a ton of extra accessories, including an alternate “Vintage” headsculpt inspired directly by the cartoon, various weapons from swords to blasters, and even a little figure of Burbie. Does a spaceship need to look like a sleek, aerodynamic fighter jet when it’s designed to traverse the vacuum of space? Definitely not, as the Borg have demonstrated with their boxy cube. But the good guys always need to look cool, which helps explain the exotic designs of spaceships in the Star Trek universe, documented in a new book series from Eaglemoss Collectibles. The first 128-page book, Star Trek Shipyards: Starfleet Ships 2151-2293, covers everything from Zefram Cochrane’s Phoenix, all the way to the U.S.S. Enterprise NCC-1701-B. Using photos of the physical and CG models of the ships created by VFX teams for the films and TV shows, the $30 book also includes the new ships seen in Star Trek: Discovery. But if you’re more of a TNG fan, next month Star Trek Shipyards: Starfleet Ships 2294 to the Future will be available, including Picard’s ship, which everyone knows is the best. We’re not sure what mood you can set besides heartbreak after wiping out half of the universe’s population with a snap of your fingers, but thankfully ThinkGeek’s new Infinity Gauntlet mood lamp can’t even do so much as burn your fingers with the six low-power white LEDs used to illuminate replicas of the Infinity Stones. Powered by 3 x AA batteries, the $40 lamp can be carried around like a lantern, or you can plug it into a USB port to leach power from your computer. Don’t expect it to illuminate a room or a fortress, however, those LEDs aren’t going to be blindingly bright. There’s a reason it’s being sold as just a “mood” light.